Eventful!!! Eventful doesn't begin to describe the last month! August saw us digging, hammering, chopping, hammering and more digging. Thanks to the kind donations of Dana and Haley, we provided Mathathane Primary School with a playground built by our own hands. Mathathane is a nearby village which we have chosen to help. Its pupils haven't got much apart from sand, stones and a few trees. 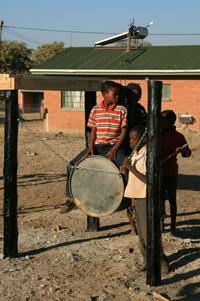 Kids can now enjoy a swinging drum, some planted tyres and a deck to climb onto. The next step is to paint it with bright colours and add some swings amongst other things. The aim of this project is to eventually start environmental education with the pupils and so teach them of the importance of conservation. Apart from the whole exercise being rewarding to volunteers we also hope to make residence of Mathathane village realise how important our natural resources are and that through changing certain habits, future generations will also be able to enjoy wilderness. These pupils might change the world if the right seeds of thought are planted early. We have nearly completed the new greenhouse and should be finished soon. Hopefully the elephants will see our hard work and leave our helpless saplings to grow so their future generations can eat some of the now locally extinct cuisine. We have made a lot of progress on some new roads to cover more area in the reserve and so hopefully deter more poachers intruding. This month our neighbours caught one of the main poachers of the last 16years! We hope that this time we're rid of them for good. The new waterhole is now deep enough to hold water sufficiently and is proving to be as popular as we had hoped. We have had some mind blowing experiences already including more than 100 elephants visiting. We have also observed them playing in the mud as we had hoped which made all the hard work, worth it. The final touches in camouflage are all that we still need to do before we can fully enjoy the new site. Everyone was very happy to finally see the tool shed completed. It was instantly put to use in giving Andrew Fryer, our International Development Officer, a roof over head during his visit. It now houses all our equipment and has opened up more space in the common area. September is the start of spring and our hot dry season. This time could be very testing to the environment. Our waterholes should get very busy and allow us to get decent data and hopefully see more carnivores. Keep an eye on our photo section.